Our Great Uncle, Dr. Robert Willis of Wellpark House was not only a good doctor but also a talented painter in his spare time. (And a friend of Sir William Wilde- Oscar’s father). 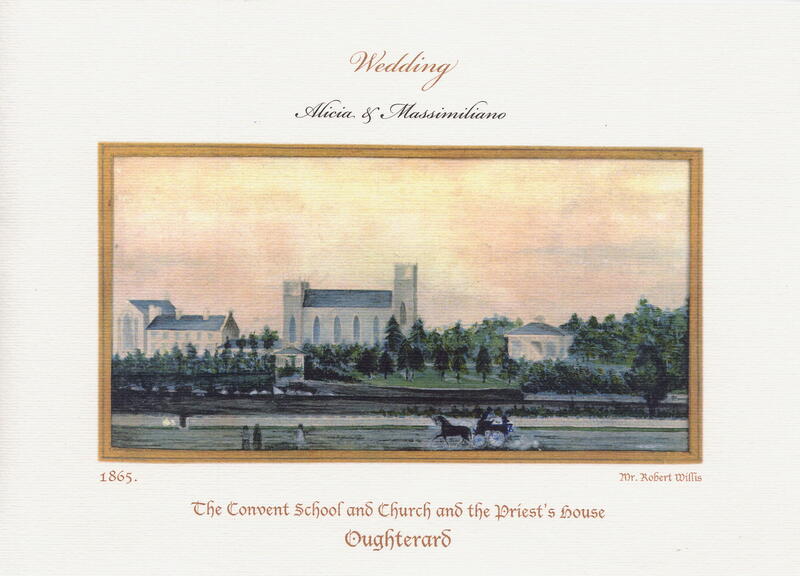 This watercolour was used as the cover for Wedding invitations to my daughter Alicia’s wedding in Oughterard in August 2008. 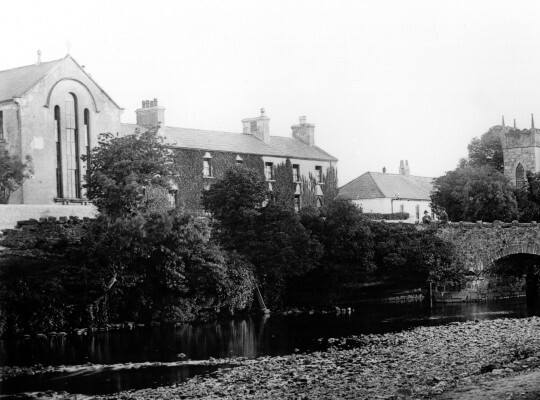 You can just make out the beginning of the old footbridge that crossed the river in front of Wellpark House. The beautiful roundish stone tower base is still visible in the church grounds by the river. It wouldn’t be a bad idea to rebuild it and allow people and especially schoolchildren, to cross the river without fear of being crushed by a juggernaut! I also have a record from my Auntie Birdie that Bernard Shaw’s grandmother lived just down the road. When I was 10 years old, I remember having had tea in Wellpark with my mother Maureen, Auntie Birdie Hynes and James Joyce’s sister who was a great friend of Birdie’s (Mary Molloy?) and was married to the Oughterard postmaster. She had just returned from a tour of the U.S. having been invited by Literary Circles to talk about her brother, James. I remember getting the impression that James Joyce was a bit of an embarrassment at the time. They wouldn’t answer my questions fully! I discovered why, when I grew up and read his books. Oscar Wilde, Bernard Shaw, James Joyce! ….Oughterard was obviously an important point of reference ! I have to sadly admit that the Convent buildings looked much nicer in 1985 than they do now. My compliments for the site. It is fascinating.